William Houston was forced to resign his position as North Carolina's stamp distributor during the Stamp Act crisis of 1765 and 1766. Stamp distributors across the colonies were forced to quit when confronted by angry mobs of citizens who believed the stamp tax was illegal. When Houston arrived in North Carolina, he went into hiding in Governor William Tryon's home. When the North Carolina patriots found out where he was, an armed mob confronted Tryon at his front door. They demanded that he turn Houston over to them, but at first he would not comply. When he saw them begin to make preparations to burn his house down, however, he quickly changed his mind. Colonel John Ashe, the Speaker of the House and leader of the North Carolina patriots, was invited in to speak with Mr. Houston who quickly realized the danger he was in. Houston came outside and was forced to march through the town and publicly sign a resignation from his position. 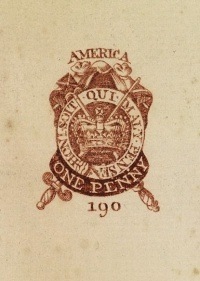 You can learn more about the history of the Stamp Act here or read the Stamp Act of 1765 text here. William Houston's resignation statement is below. I do hereby promise that I never will receive any stampt paper which may arrive from Europe in consequence of any Act lately passed in the Parliament of Great Britain nor officiate in any means as stamp Master or Distributor of the Stamps within the Province of North Carolina either directly or indirectly and I do hereby notify all the Inhabitants of His Majesty's province of North Carolina notwithstanding my having received information of my being appointed to the said stamp office not to apply hereafter for any stampt paper or to distribute the same untill such time as it will be agreeable to the Inhabitants of this Province: Hereby declaring that I do execute these presents of my own free Will and Accord without any Equivocation or mental Reservation whatsoever. In Witness hereof I have hereunto set my Hand this 16th Day of November 1765.